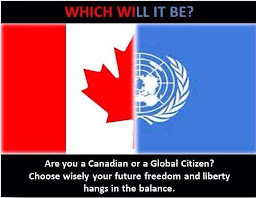 You've no doubt heard the old saying "up to their necks in mischief," haven't you? 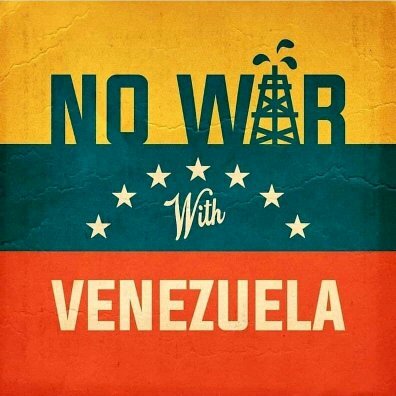 Well, it is definitely applicable to the Illuminist elite and their legion of secret society puppets. 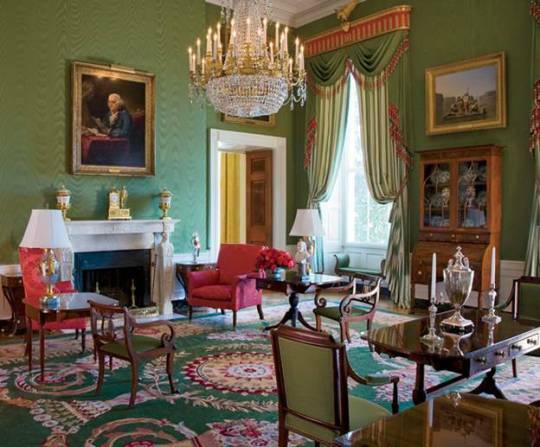 Hanging over the fireplace in the famous Green Room at the White House in Washington, D.C. is an acclaimed oil portrait of Benjamin Franklin, one of our country's most celebrated "founding fathers." It depicts the famed statesman sitting studiously, poring over an ancient document which he is holding with his right hand. His left hand, meanwhile, is at his throat, set with the finger in a V-design, the thumb pushing upward to his chin. Franklin's neck is a prominent focus of the painting. Obviously, this is a sign Franklin is communicating. The same Encyclopedia spends a great amount of space listing Franklin's exploits and positions held as a Freemason, not only in the United States, but in Great Britain and in France. In 1779, he was elected Worshipful Master of the Lodge of the Nine Sisters in Paris, and in 1782 he became head of a lodge of the Grand Orient de Paris. 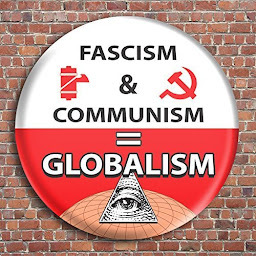 Earlier, Benjamin Franklin had officiated at the Masonic funeral of one of his "brothers," the monstrously wicked atheist, Voltaire.2 Voltaire, as historians will attest, was certainly up to his neck in mischief. 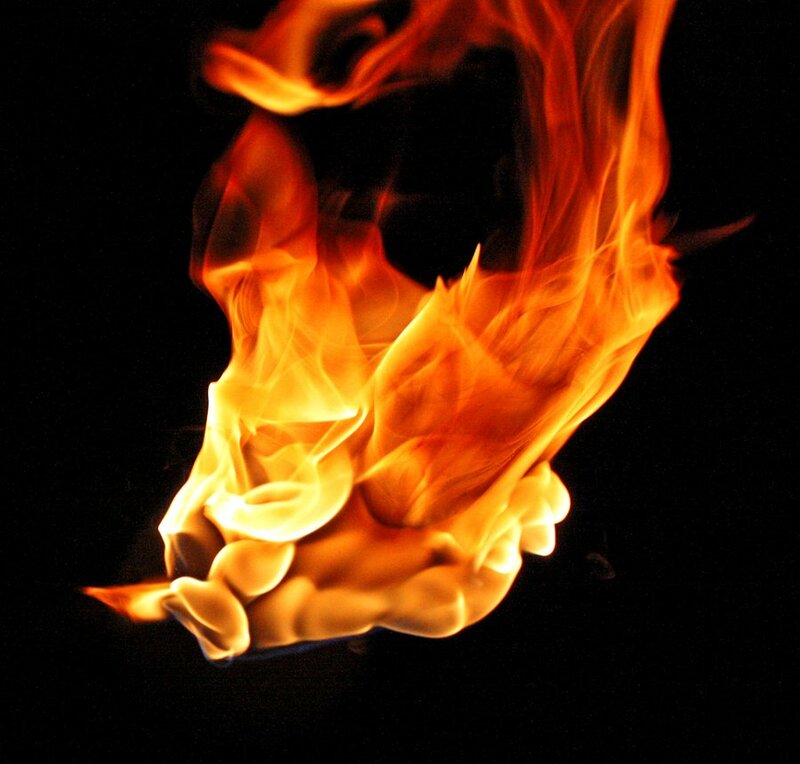 A number of dictionaries of symbols state that the hand placed on the neck signifies sacrifice. 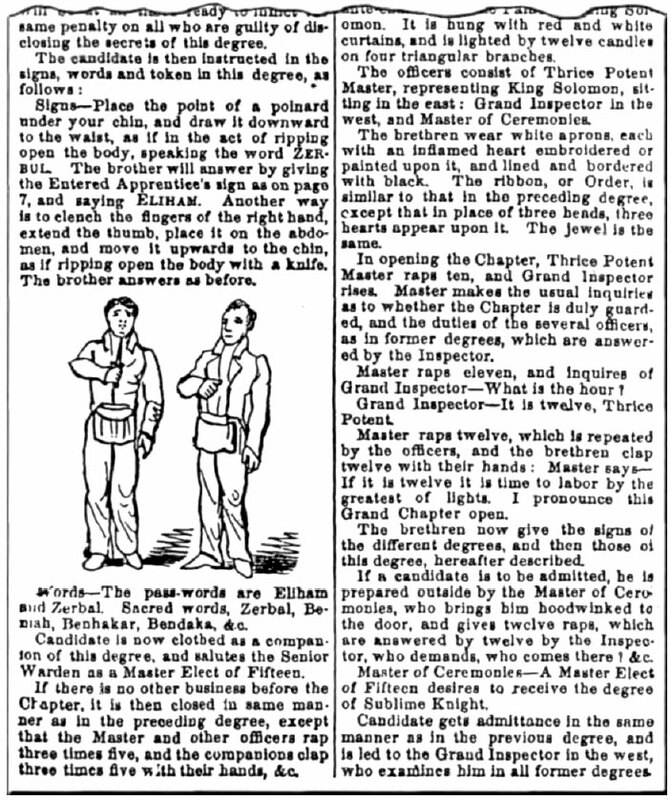 Now sacrifice can have at least two meanings—one, the continuing threat of the penalties to be applied to punish those adepts and initiates who so impertinently reveal the secrets of the Order; and two, the willingness of the individual performing the sign to sacrifice himself for the good of the Order, or for the good of the cause or Great Work of the Illuminati. 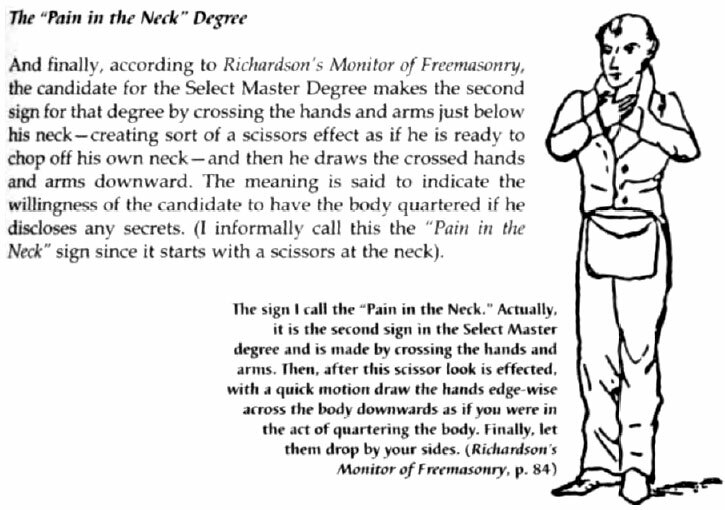 The ritual for the Grand Master Elect Degree, according to Richardson's Monitor of Freemasonry, has the candidate either placing the point of a knife under the chin, or alternatively clenching the fingers of the right hand, extending the thumb, placing it on the abdomen, and moving it upwards to the chin, as if ripping the body open with a knife. 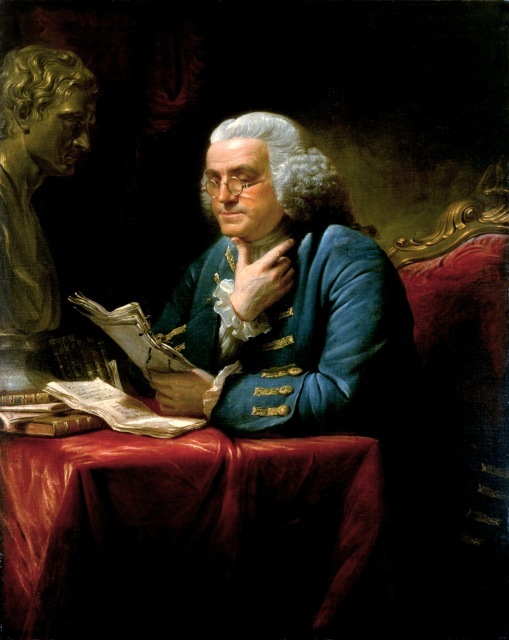 Benjamin Franklin, Rosicrucian and Mason, from an oil portrait painted by David Martin in 1766. This famous painting today hangs over the fireplace in the Green Room at the White House. 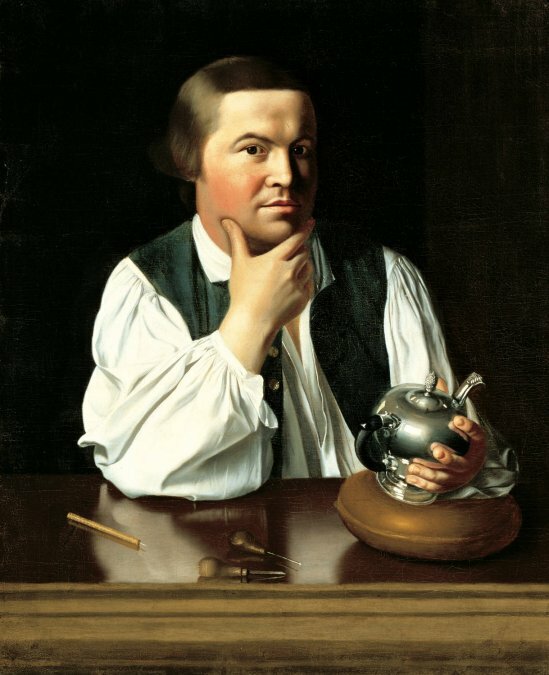 Portrait of Paul Revere, by Copley. The Scottish Rite reference, 10,000 Famous Freemasons, lists the celebrated American patriot, made famous by his night-time horse ride warning citizens the British troops were at hand, as an initiate of the Masonic Lodge. 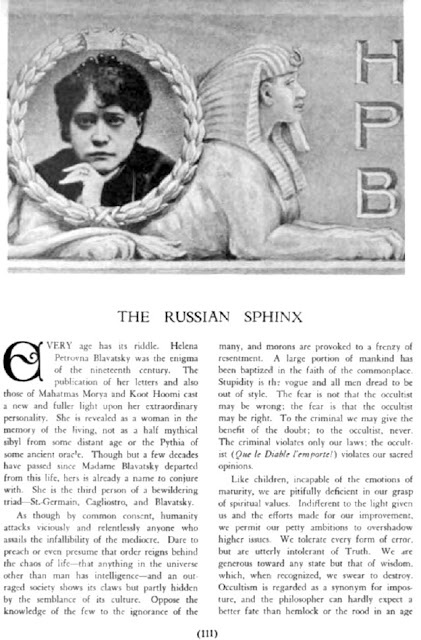 Helena Petrovna Blavatsky, Co-Mason, Russian mystic and Egyptian Hindu devotee, who founded the occult group, Theosophy. Her classic occult text, The Secret Doctrine, inspired Adolf Hitler and thousands of others. 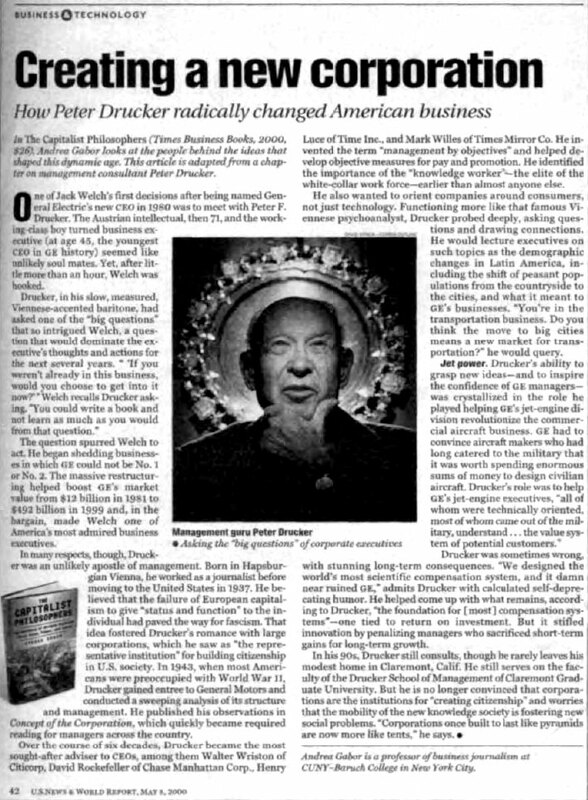 This unusual photo of "management guru" Peter Drucker in U.S. News & World Report (May 8, 2000, p. 42) paints Drucker as a contemplative, God-like character who has "sacrificed" for the Illuminati Order. 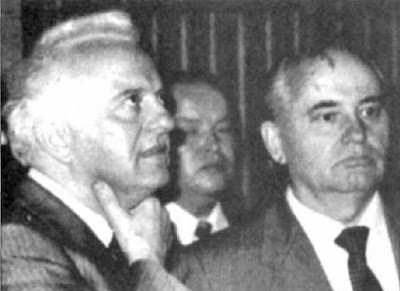 Soviet Foreign Minister Eduard Shevardnadze (left), protege of President and Communist Party Boss Mikhail Gorbachev, was a favorite of the Illuminati. 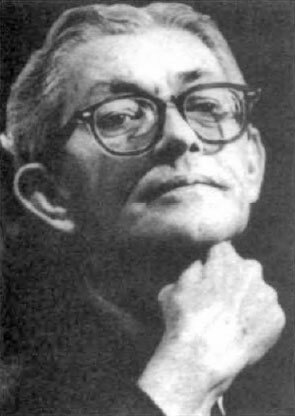 James Jesus Angleton, CIA Chief of Counterintelligence, presents the clenched fist under chin and throat—sign that a violent end at the hands of revolutionary assassins shall come to he who reveals secrets of the Craft. 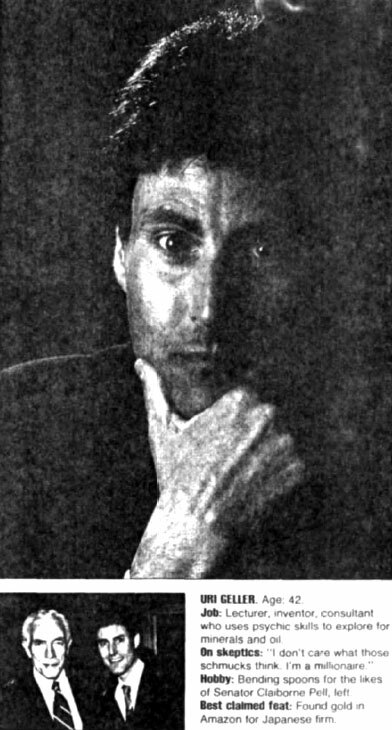 The Scottish Rite Freemasons, on the cover of the September 2000 issue of their official journal, recognized "Brother Michael A. Richards" as a "Renaissance Man, Not Kramer." 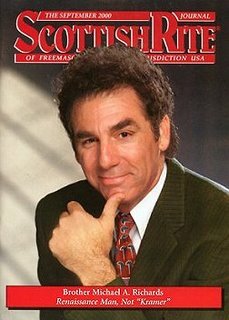 Richards, a Jew, is the well known comic actor who won raves for his role as "Kramer" in the long-running #1 hit TV show, Seinfeld. 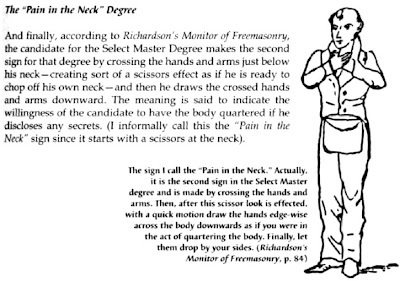 Inside the Masonic Lodge magazine, it was noted that Richards holds the 32nd degree of Freemasonry and has received the red cap. 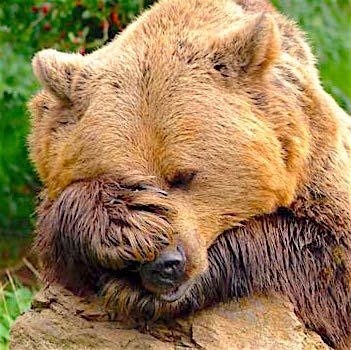 Richards says he is a keen student of Masonry and its symbolism and has over 1,000 masonic books in his home in California. 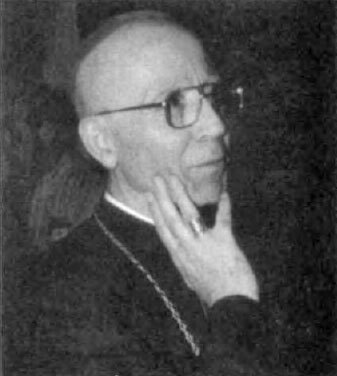 Observe Michael Richards' clearly Masonic handsign, which presents the V and is the "due-guard" sign of initiation in the Order of Knights Templar which relates to the penalty of the obligation—the oath agreeing that one's head will be impaled on the highest spire in Christendom as a penalty for revealing secrets. The sign is also similar to the sign for the "due-guard" of the Past Master, 5th degree in the Scottish Rite. 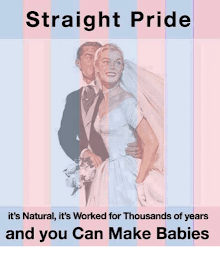 U.S. 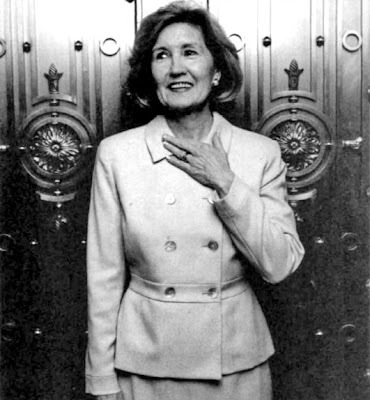 Senator Kay Bailey Hutchinson (R-TX) is highly exalted by the elite as this photo demonstrates. The strategy of this photo, with the Senator standing between two swords (symbols of authority) and two encircled sun signs (symbol of the Masonic and Illuminati Deity of Light) shows great favoritism toward this lady, especially as this bio-sketch and photo is in a major newsmagazine, Newsweek (June 26, 2000). "Staying in the spotlight. If Pakistan can elect a woman leader, says Hutchinson, why can't the United States?" Judging from this staged rite, the regal doors may be about ready to open wider for Senator Kay Bailey Hutchinson. A few signs of the Rosicrucian Order. 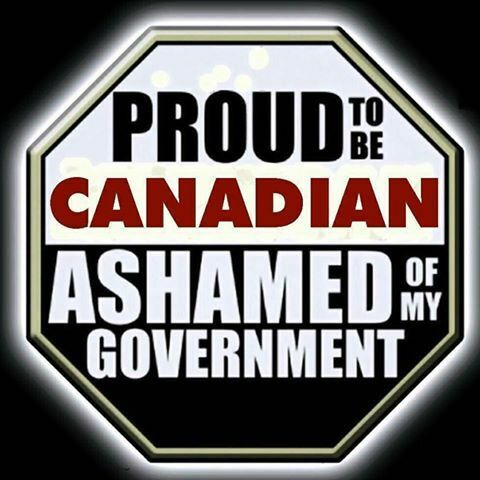 Many are similar to those of Freemasonry and other secret societies. 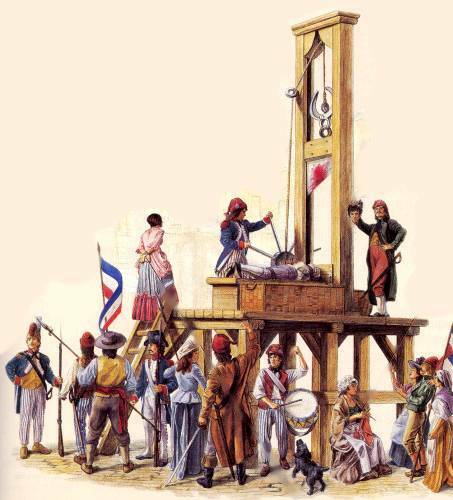 The penalty sign related to having one's throat cut is shown at number X.